Posted on Tue, Mar 20, 2012 : 8:03 p.m.
Michigan freshman forward Travis Lynch, left, played junior hockey at the Resch Center in Green Bay, Wisc., where Michigan will play in the first-round of the NCAA Tournament this weekend. When pressed for a restaurant recommendation in Green Bay, Wisc., Michigan freshman forward Travis Lynch -- who played junior hockey in Green Bay for two years -- endorsed the local Noodles & Company. Lynch’s two years in Green Bay weren’t spent developing an appreciation for fine dining. They were spent developing as a hockey player. More so than the penne rosa, Lynch is looking forward to his return to the Resch Center, the site of this weekend’s NCAA Tournament Midwest Regional, and where Lynch won a United States Hockey League championship with the Green Bay Gamblers in 2010. The Wolverines (24-12-4) are the top seed in the Midwest and take on Cornell (18-8-7) on Friday night (9 p.m., ESPNU). Ferris State (23-11-5) and Denver (25-13-4) meet in the first semifinal on Friday. The winners play at 9 p.m. Saturday with a berth to the Frozen Four on the line. Lynch is also looking forward to seeing the host family that he stayed with for two years. Lynch's parents will spend the weekend with the family, who will trade their Gambler black and gold for maize and blue. "We're all just extremely excited to see Travis play," said Michelle Faggio, who along with her husband, Mike, were host parents for Lynch. 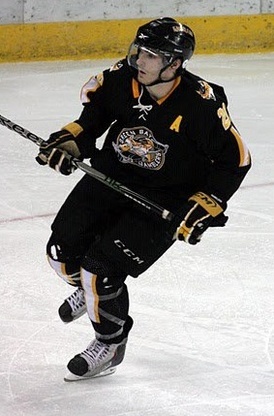 Travis Lynch while playing for the Green Bay Gamblers. Photo courtesy of the Green Bay Gamblers. Michelle's father played football at Notre Dame, so she has always been a big fan of the Fighting Irish. Lynch has led her to switch allegiances during hockey season. "We're Michigan all the way," Faggio said. "We love watching the games and watching Travis play." There were more than 8,400 fans in the 10,200-capacity arena when Lynch helped the Gamblers win the Clark Cup in 2010. Michigan coach Red Berenson doesn’t expect that many to be there this weekend, but former Gamblers coach Jon Cooper believes Lynch’s presence -- along with former Gamblers teammates David Makowski, who plays for Denver and Scott Czarnowczan, who plays for Ferris State -- could help boost that attendance. Cooper -- whose last year in Green Bay was Lynch’s first -- remembers Lynch as a quiet, undersized, and respectful kid who kept to himself mostly off the ice, and flipped a switch once he was on it. Lynch had 11 points in Michigan's first 15 games of the season, but has only had four in the 23 he’s played in since. Though his production is down, his penalty killing prowess ability has helped him stay cemented in the lineup. He leads the team in short-handed scoring (one goal, one assist) and shots (11). It’s a skill Cooper remembers in Lynch. During the semifinal round of the Gamblers’ championship run, Green Bay was on the penalty kill with just two minutes remaining in the third period before Lynch picked off a pass on the penalty kill and scored shorthanded in the eventual win.